In California on Election Day, Clinton led Sanders 56.4-43.6%. Sanders leads in votes counted since Election Day by 52.3-47.7% . These include mail-ins, crossover ballots, provisional ballots and others. The votes have been individually verified. That is a whopping 17.4% discrepancy in margin from Election Day. It appears that nearly 15% of Sanders’ votes were flipped to Clinton on maliciously-coded voting machines and central tabulators. View the CA Update spreadsheet. 1- Previously registered voters’ names had been removed from the rolls. 2- Some were marked as vote by mail voters – but they had received no ballot in the mail. Virtually all who were not allowed to vote and forced to vote provisional ballots were Bernie Sanders supporters. Poll workers in Los Angeles and Orange County report that Bernie won the electronic votes in their precincts by well over a 2 to 1 margin, the opposite of the vote count. The contrast indicates vote-flipping. 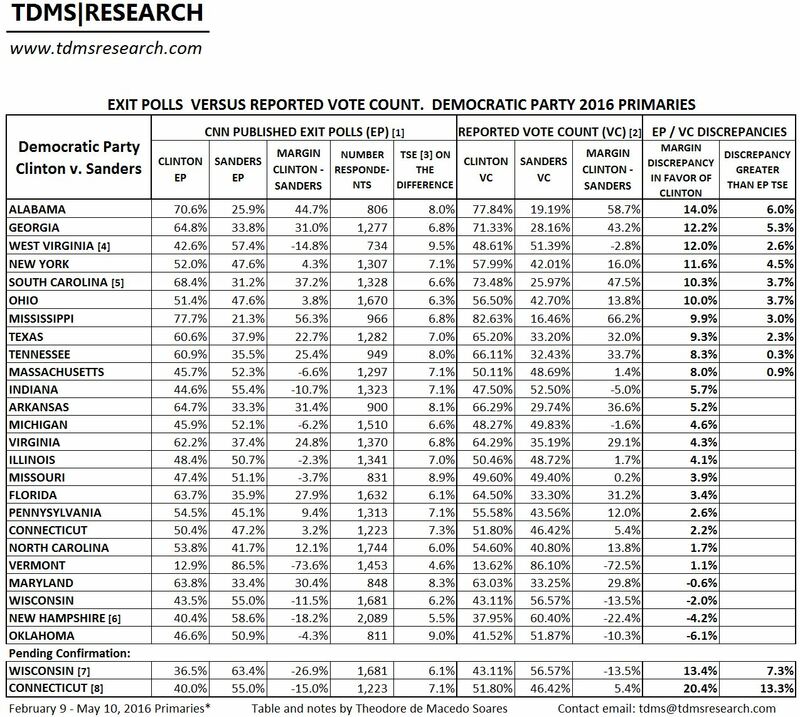 If you add the lower figure of 50% of voters who were not allowed to vote regular ballots for Bernie to the votes he received, you wind up with a substantial Sanders landslide victory in California. The primary beneficiary of the fraud is Hillary Clinton. Election Justice USA is a voter advocacy non-profit organization which demands a hand audit of the early mail-in ballots. It asserts that the Capitol Weekly early-voter exit poll conducted across the state of California yielded a 23 percent discrepancy in Los Angeles vote-by-mail ballots compared to the actual results. In Los Angeles area polling of the early round of mail-in voters, Hillary Clinton lead over Bernie Sanders was less than 10 percent. There was no exit poll, so let’s assume the following. Clinton needed an implausible 85% of Democrats to match her 53.5% share. What if: Clinton had 65% of Democrats? Sanders would have won by 55-45%.